Moisture vapor transmission means big trouble for concrete finishes. Bone Dry’s line of concrete sealers encapsulates moisture in concrete slabs and structures, extending their longevity. Our penetrating sealers leave a permanent vapor barrier which strengthens concrete and prevents surface dusting and mold growth. Unlike surface sealers, our penetrating solution creates a barrier beneath the surface and chemically bonds with the free lime and alkali elements found in concrete. Bone Dry essentially transforms a porous concrete structure into a solid, waterproof mass. Our original penetrating concrete moisture barrier solution prevents water vapor transmission from deep in the concrete slab. The barrier protects adhesives, paint, floor coverings and the structural integrity of concrete from the effects of surfacing moisture. Bone Dry Standard also reduces downtime between the pouring of concrete and flooring installation. Bone Dry Standard sealer covers approximately 220 square feet per gallon. For commercial projects over 2000 square feet, Bone Dry Pro is the total solution for commercial concrete slab waterproofing. 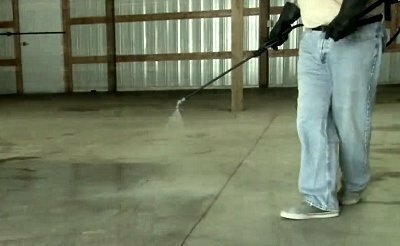 It creates a permanent seal deep in the concrete slab and minimizes dusting, hardens substrates, and prevents mold and mildew growth. As America’s #1 penetrating concrete sealer, Bone Dry Pro comes with a 20-year warranty against concrete moisture-related failures. Bone Dry Pro preserves commercial-sized concrete floors, and drastically reduces project down time between pouring concrete and installing flooring. Mold growth beneath floor coverings is a serious problem for homes and businesses. Bone Dry Plus incorporates admixtures which prevent mold and mildew growth in concrete slabs and between concrete floors and coverings. Paired with the solution’s deep concrete sealing properties, mold caused by moisture won’t be able rear its ugly head. Bone Dry’s penetrating concrete sealers are non-toxic and are easy to apply to new or existing concrete slabs. Medical facilities, restaurants, bars and more are protected from mold growth in their flooring with Bone Dry Plus. Concrete floors treated with Bone Dry penetrating concrete sealers can have flooring installed on top approximately 72 hours after application. When Quick Dry is added to the sealer, finished flooring can be applied 6 hours after application. Our cost-effective concrete sealers give contractors, architects, masons and homeowners extra time when sealing concrete slabs and brick patios. Contact Bone Dry Products to learn which concrete sealer is right for your needs.